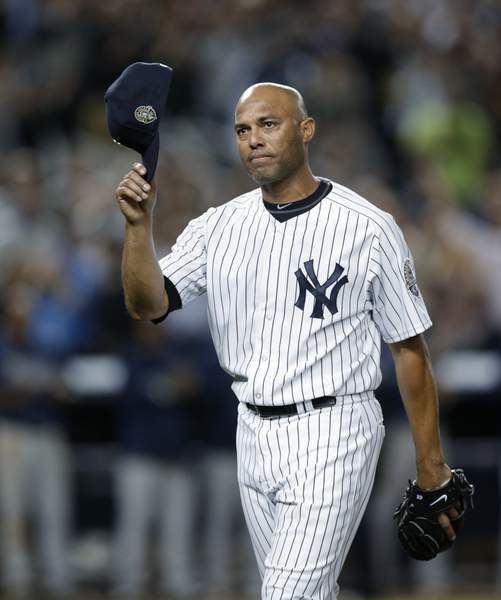 Associated Press Former New York Yankees closer Mariano Rivera could be the first unanimous Hall of Fame selection today. NEW YORK – Mariano Rivera figures to make quick work of his Hall of Fame ballot appearance, just as he did of opposing batters, and could even set another record when voting is announced today: for highest percentage of ballots. Rivera was picked by all 217 voters totaled through Monday afternoon by Ryan Thibodaux's Hall of Fame vote tracker, about half the expected ballots. Rivera set the career saves record with 652 in 19 seasons plus 42 more in the postseason. The New York Yankees didn't even wait until his final game to retire his No. 42 – he was the last player in the major leagues to wear that number, grandfathered when No. 42 was retired in honor of Jackie Robinson in 1997. Rivera's efficiency was renowned on a Yankees' dynasty that he helped win five World Series titles: He retired the side in order in 229 of his 491 three-out saves, according to the Elias Sports Bureau. He broke the previous mark of 601 saves, set by 2018 inductee Trevor Hoffman. “I wanted to get some dirt, just stay there for the last time, knowing that I ain't going to be there no more,” he said. Halladay's election will be tinged with melancholy. The two-time Cy Young Award winner died in November 2017 at age 40 when the airplane he was piloting crashed into the Gulf of Mexico off the coast of Florida. He went 203-104 with a 3.38 ERA in 12 seasons with Toronto and four for Philadelphia. In 2010, he pitched a perfect game against the Marlins in May, then threw a no-hitter against Cincinnati in the NL Division Series opener – only the second no-hitter in postseason history after Don Larsen's perfect game for the Yankees against Brooklyn in the 1956 World Series. Halladay retired at age 36 because of back injuries. He was tracking at 92.6 percent, an overwhelming choice. Martinez received 36.2 percent support in his first ballot appearance in 2010, well short of the 75 percent needed. He rose from 27 percent in 2015 to 43.4 percent the following year, to 58.6 percent in 2017 to 70.4 percent last year, when he fell 20 votes shy of the 317 needed.